Home / Europe / International / product or service reviews / Air France Premium Economy-detailed experience! 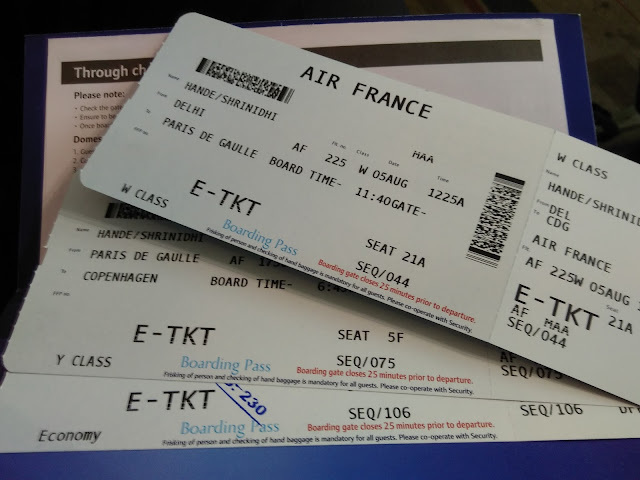 I had my first flight with Air France this week. Luckily it was the Premium Economy class. 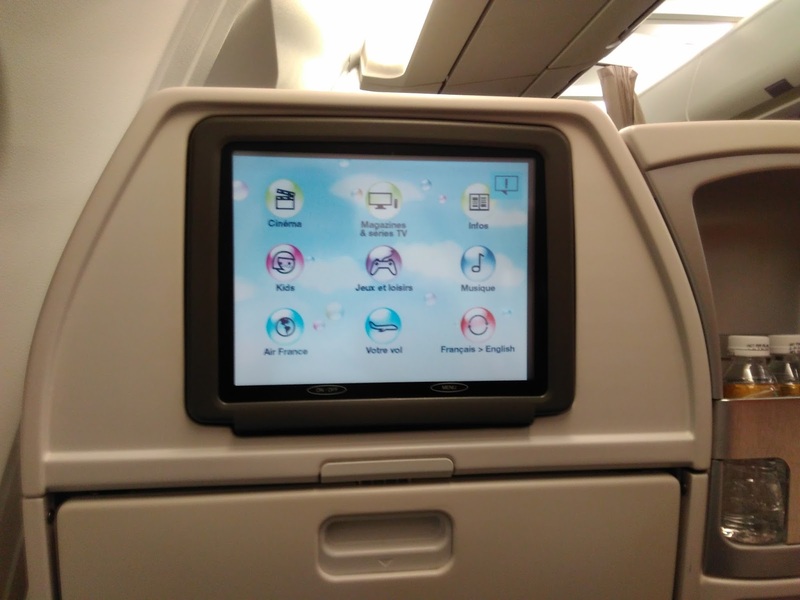 Premium economy is a compromise between business class and economy class. 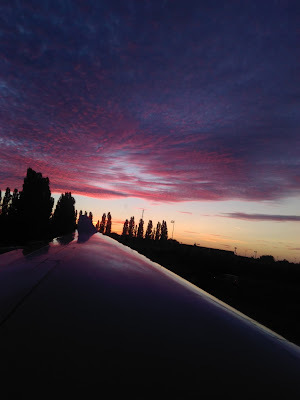 This post shares my Air France experience. The ticket issued didn’t call out Premium Economy. I didn’t really know it was premium economy till I logged into Air France website and reviewed my itinerary. No Web Check-in. First leg of my trip was Chennai-Delhi, operated by Jet Airways (Economy). I couldn’t do web check in. I did receive automated mail from Air France asking me to do web check-in, but Air France website said I should check with partner airline (9W) website. Jet airways website said I should check with partner airline (AF). So no web check in for me. They could avoid all this confusion by simply adding a line in the ticket that web check in is not available for this ticket. Also I couldn’t see my class for Paris-CPH leg before hand- came to know about it only after doing through check in at Chennai. Rest of the process was smooth. Jet airways only served some light snacks instead of meals and flying in 737 was a nice experience after too many A320 flights. But my window seat had no window due to aircraft design. All my previous international trips were ex-Chennai. For the first time, I cleared immigration at Delhi, T3. Baggage Troubles: As we waited for boarding announcement at Gate 12, a shocker was awaiting me. My name was announced in public address system to approach a ground staff. When I met them, I was told my baggage, which was through check-in from Chennai is overweight and hence I was asked to pay extra. Premium Economy guests are entitled for 2 bags of 23 kg each. I had one bag of 28 kg. This was largely because for the first leg, Jet Airways economy class allowed only one check in bag. Jet airways staff at Chennai didn’t raise any concern about overweight. Since it is within my overall 46 kg limit, I assumed everything is fine. If jet airways staff had told me that in Delhi I will be made to pay for extra weight, I would have split the load and checked in another bag. At Delhi, after completion of first leg, I was asked to pay 75 USD. This was told to me at a very high voice as if a public announcement “Hey we got a guy who is going to pay extra for his bags”. At this moment I am denied access to my bag so that I can reshuffle and check in second baggage. Only option was to pay Rs. 5090. This is despite having a load 18kg less than what’s allowed for my ticket. Any more conversation and reply from staff was “You can go and complain with that airline”. I paid by card and transaction went through without me having to enter PIN. Two factor authentication mandated by RBI is not being followed. Code share responsibilities do not end with selling tickets. Air France need to have better coordination with their partners, have proper process in place for various possible scenarios and communicate right information to customers, so that guests get to enjoy a seamless experience. Yes, staff is going by the rules, but if there’s a problem with my bag, it should be communicated at the check-in counter, not half way through the journey. I feel this is a case of poor coordination between Air France and Jet airways or a tactic employed to arm twist customers to pay extra. Premium Economy is a new product in the market- some fine tuning is still required for it to mature. Premium economy is a middle ground between business class and economy. It is slightly more spacious and comfortable, you get more food to eat. But then not a match to full fledged business class. Price wise also it is only marginally more than regular economy. So it is a perfect choice for those who can’t afford business class but find economy class too mundane. The Airfrance Delhi-Paris flight had 3 rows of Premium Economy seats. 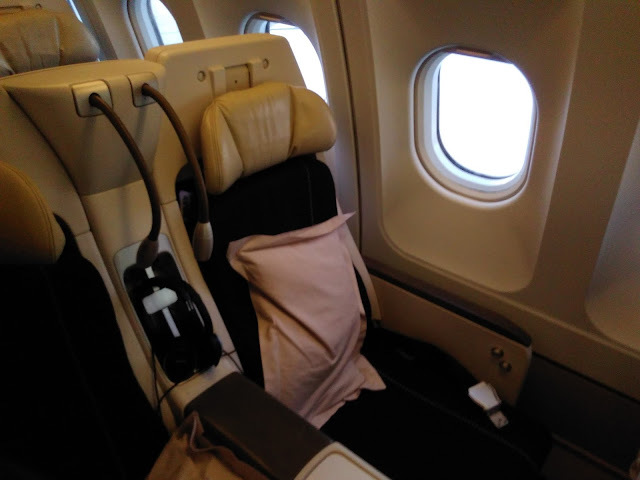 While business class is 6 seats per row, Premium economy is 7 seats per row. Economy was 2+4+2 configuration. (Please note that these layouts may change for other aircraft types). Premium economy seats are wider, an additional knee support exists, we get a stylish over the shoulder lamp. But my row 21 seats were not reclining back. This did cause some inconvenience while trying to sleep. A comfort kit and some more items to eat compared to economy. Tray table is wide and it is very comfortable to open your laptop and work. A power socket would have been very nice. Noticed that at least 10 Business Class seats were empty. But no upgrades were offered to anyone. Many of Air France cabin crew were very aged a bit, but were very courteous. All passengers got a personal Namaste. Then I turned my attention to the entertainment system. It had Hindi movie PK and many more. But English ones were very few. Some movies had English sub titles but many tv shows etc had no English sub titles either. There was a few seconds lag while operating menus. Overall inflight entertainment is fine, but doesn’t match Emirates. Food: Food was very good on Delhi-Paris leg. Enjoyed miniature onion uttappam and rava upma with Sambar. Tasted very well. Menu was in Hindi also and menu caters to both Indians and French nationals with equal importance. Lufthansa also has premium economy which claims to get over 16 advantages over economy class, for a ticket fare twice as expensive as economy. Air france premium economy I could count about 10- may be there’re some more- I am unable to identify as I haven’t flown in their economy class. Premium Economy passengers do not get free lounge access (the on board video says so though) but they can buy access at CDG at 45 Euros, subject to availability. (Only limited number of people are allowed inside).I got some really nice sunrise shots around Paris. One sample below, will write a separate post on it. Transit experience at Paris CDG:I had about 70 minutes connecting time at Paris to catch my onward flight to CPH. But our arrival at Paris was delayed by few minutes. And then, I experienced that transit through CDG is a relatively complex/time consuming process. From the craft we had 10 minute bus ride to Terminal E2. Then we had to walk a lot for transit area, clear security and passport control. I observed that Europeans and Americans are seldom subjected to frisking but Asian looking passengers are thoroughly frisked. Passport control took lots of time. Then I had to walk a lot to my next departure gate. By then the gate was closed. I was asked to got to Gate 56 for alternate arrangements. I was put on next flight which is 6 hours away. I was given a 16 Euro food coupon but no lounge access. The new boarding pass clearly said I had priority boarding. At first look, I found it very difficult to find a charging point in CDG. But later I realized that they are there everywhere, covered by a flip. Also there were no clocks showing local time, so I had to use google. But then, TVs showing flight timings show current time in top left corner. Free Wifi at CDG airport worked seamlessly, though once a while I had to re-sign in. Found a nice keyboard that I could play as much as I felt like. 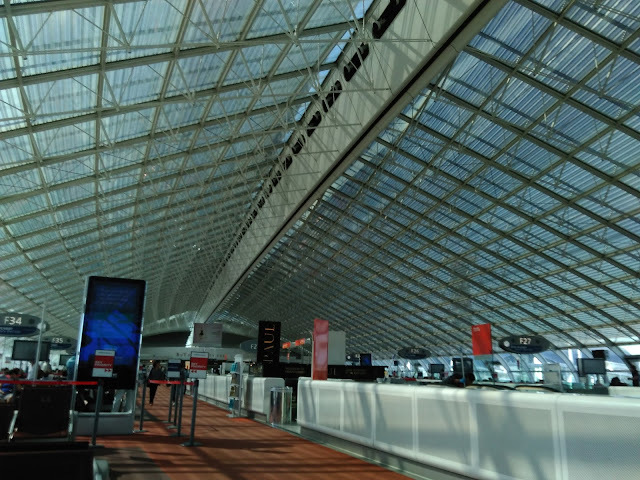 Bottom-line: Try to keep 2 hour connection time at CDG. Less than 90 min, you are very likely to miss the connecting flight. The last leg was fine- except priority boarding there was nothing premium about it. 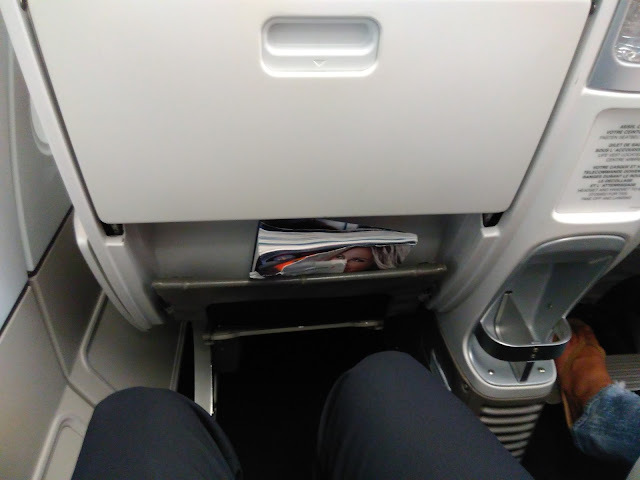 It was an A319, had regular super thin seats without any recline. That is a common with taking European airlines for Europe- for last leg, you might get a super small plane or even an ATR. But at times this might work well, since the baggage will arrive little quicker. Thanks for the comment. I have an ordinary card which doesn't get me that much access. Everyone has a credit card and they can't keep giving access to lounge to all. Only some premium cards get free access. For most others, it is some discount or an option to redeem points for lounge access that is all.. I flew Air France long back and found them good enough. I know baggage charge is a big booster to Airline Profits these days. Alas! Excellent review of the flight and your experiences. have traveled a lot through these terminals, i can sympathize with you. air travel is still a lot dependent on the ground personal in charge instead of pure policies. If your chennai Delhi leg was on the same PNR as the international leg Jet would have honoured your 2 bag limit with Air France.